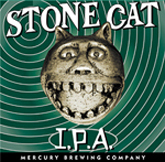 The Stone Cat IPA pours a medium yellow color with a large, frothy off-white head. Body is clear beneath excellent lacing and a mostly lasting head. Aroma is of moderate hops with pine notes, and light yeast with soap notes. Initial taste is lightly bitter, building into a moderately acidic finish with a long duration. Light to medium on the mouth, we're left oily with soft carbonation. Reviewer's notes: "This is good competition for the Harpoon IPA, yummy"